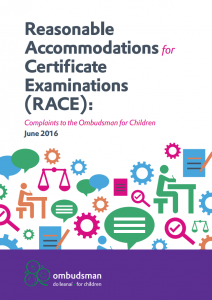 This report provides an overview of common themes in complaints made to the Office of the Ombudsman for Children (OCO) about the Reasonable Accommodations for Certificate Examinations (RACE) scheme administered by the State Examinations Commission (SEC). The RACE scheme provides supports to young people with special educational needs so that they can access state examinations such as the Junior and Leaving Certificate. Examples of reasonable accommodations include exam papers with large print or in Braille for young people who are visually impaired or provision of a reader or a scribe for young people who have specific difficulties with reading and or writing. Schools apply to the SEC for reasonable accommodations on behalf of their students. This includes an application form setting out the young person’s eligibility and background documentation supporting the application. When a young person has a specific learning difficulty (SLD), this background documentation includes evidence of test results, which demonstrate that the young person meets the eligibility criteria. If a psychologist has assessed the young person, the most recent report must be included. However, these are not necessary as school staff members can use tests to determine a young person’s general ability. These tests focus on a young person’s potential to learn. Applications also include results of attainment tests, which demonstrate what the young person has learned (e.g. reading level). The guidance documentation issued to schools by the SEC includes a list of suggested tests that schools can use and what should be included with applications. The documentation included reflects the type of accommodation required. For example, the application must include examples of the young person’s written work if the application is for ascribe. In 2014 and 2015, the OCO received 132 complaints about the State Examinations Commission’s administration of this scheme. We provided support and advice in 92 cases and examined 40 cases in accordance with section 8 of the Ombudsman for Children’s Act 2002 (as amended). This report focuses on applications for RACE when young people have an SLD. SLD is an umbrella term, which covers a range sometimes co-occurring difficulties. It means that someone has a significant difficultly in one area such as reading and spelling while coping or excelling in other academic areas. One of the most common SLDs is with reading and/or spelling (dyslexia). SLDs can occur in other areas too such as language (dysgraphia), maths (dyscalculia) and gross and fine motor coordination (dyspraxia). Following intervention from us, either of the 40 young people received some level of redress from the SEC. However, most decisions remained unchanged as some of the applicants did not meet the criteria for RACE. Despite this, it became clear that there were common themes in the majority of complaints that suggested elements of poor administrative practices. We have highlighted these issues to the SEC through individual cases and through this report. We hope that by addressing these issues, the SEC can facilitate better management of young people and families’ expectations about the type and nature of support at examination time. The SEC told us that the Board is currently reviewing the scheme and the RACE scheme is subject to a series of reforms.